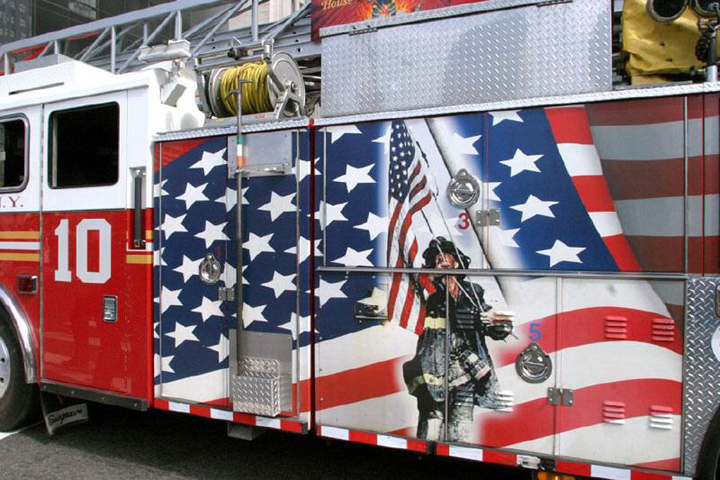 A close up view of the hand painted montage which adorns both sides of the Seagrave 100 ft. rear mounted aerial. That is a nice picture of the firefighter raising the american flag on 9/11. Added by Kurt Jasinski on 23 September 2008. The mural is actually a large transfer. It is one of ten that were produced when Seagrave built the truck. The other nine are in storage, and I think I'm correct in saying that the new Ladder 10, a Ferrara carries the mural too. Added by Andy Fish on 17 March 2013.